Friday evening arrives. Off you go to your grocery store and you find yourself in front of a bunch of do-it-yourself cleaning machines and the various cleaning solutions available. There are products to put on the carpet before you clean it. Products to put in the machine with the water. Also other types of products for all kinds of spots and stains. Still others for pet odors. You aren’t sure which ones you will need, so you grab a selection of them and take them to the front of the store to pay. Did you call your carpet cleaning pro? You know, those who have the training and the very best equipment and cleaning solutions to get the job done right. Don’t ruin another weekend. 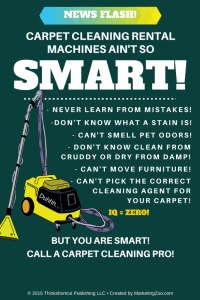 Do the smart thing and hire a professional to do what he does best: Clean your carpet.